An observable collection of 3rd party framework elements, the purpose of which is to allow developers to add a custom control to the chart (e.g., add a button or create your own data grid). This framework collection resides on top of the ChartControl in order to prevent 3rd party custom controls from interfering with native NinjaTrader chart framework members. 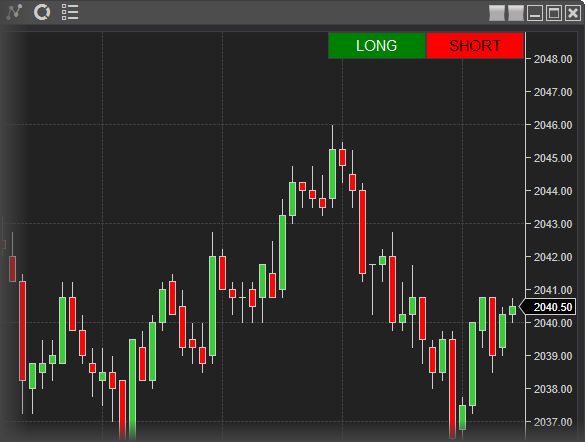 For example, if you wish to add a button to a chart, it is recommended to add it to this UserControlCollection rather than attempting to modify or add to any pre-existing NinjaTrader chart elements. 1.This collection is provided "as-is" and does NOT contain any automatic layout options. By default, the last added framework element will reside on top of any previously added controls. This means it is possible for a user to install two NinjaScript objects which may be competing for an area of a chart. 2.Once the NinjaScript object is removed from the chart by the user, the custom control will be automatically removed from the collection. // e.g, "Error on calling 'OnStateChange' method: You are accessing an object which resides on another thread."